Genealogy is often like pulling the arm of a slot machine. Sometimes you do it just to watch the symbols spin by without any real expectation that you’re going to hit a jackpot. But it’s pretty amazing when you do and 30 years of arm pulling finally pays off. This past week I made an unexpected find in the form of an obituary for Elizabeth E. Ferry. This particular brick wall (not the best way to talk about your great great great grandmother!) stemmed from the fact that none of Elizabeth’s 10 surviving children seemed to know the name of her mother. 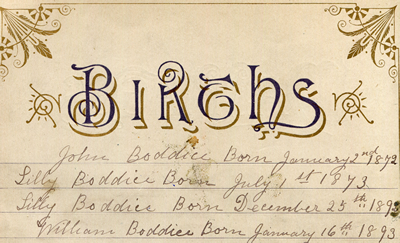 The line for Mother’s Maiden Name on Elizabeth’s Certificate of Death reads “Don’t Know”. The death certificates of Elizabeth’s children were no more helpful. How could people not know the name of their grandmother? I still don’t have an answer to that, but I do now know her name. Also surviving are three half-sisters and one half-brother, as follows: Mrs. Amanda Miller, York; Mrs. Hannah Harding, Texas, Md. ; Mrs. Sadie Harmon, Cockeysville, Md. ; and J. E. Knopp, Rocks, Md. All I needed were leads and now I had four. Elizabeth’s father was John Ferry; that’s all I know about him. If the people listed in the obituary were half-siblings, that meant Elizabeth’s unnamed mother was married at least twice. 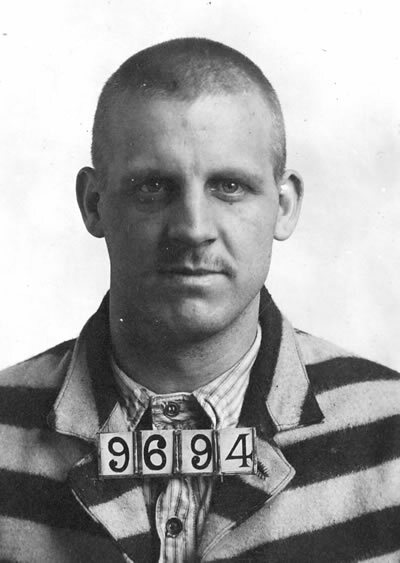 It took no time at all to find Joseph E. Knopp, Jr. of Rocks, Maryland (and his wife Amanda and their ten children). Next, I found Hannah J. (née Grafton) Harding of Texas, Maryland (and her husband Ephraim and their five children). Notice the maiden name? Mr. Grafton is Husband #3 for Elizabeth’s mother. Third, I found Amanda (née Grafton) Miller of York, Pennsylvania (and her husband Thomas and their five children). 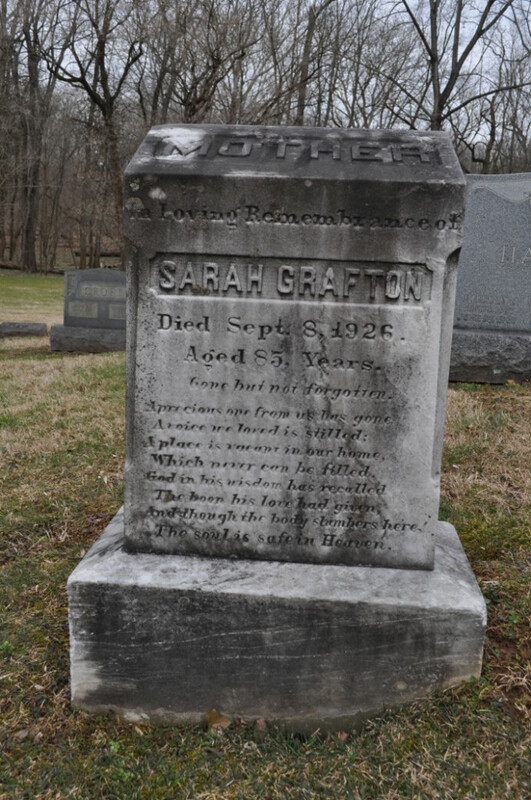 Lastly, I found Sarah (née Grafton) Harmon of Cockeysville, Maryland (and her husband Samuel; still digging-up information on them). So who is the mother? In 1920, Thomas and Amanda Miller lived at 588 North Water Street in York, Pennsylvania. Thomas was a signal repairman for the Pennsylvania Railroad. Every night he’d come home to his lovely wife, four children, and his mother-in-law — Sarah Grafton. We have a name! Sarah was 79 years old and widowed, probably for the third time. Finding Sarah before 1920 has been difficult, she does however appear in 1860 under the name Sarah Knopp, married to Joseph E. Knopp Sr., with a one year old daughter (who was not living at the time of Elizabeth’s obituary). In that census, Sarah is living with her parents, John and Susanna (née Cramer) Harman. One breakthrough just gave me two generations and an abundance of family to research. The question is, why didn’t the Channells know who she was? Elizabeth used to visit her sisters in Texas, Maryland (near Cockeysville) from time to time. Whoever wrote the obituary knew every surviving Channell and their whereabouts (including Clarence who was imprisoned in Denver at the time) and the names and locations of Elizabeth’s half-siblings. What happened to Elizabeth’s husbands? Did she have a special mushroom soup recipe that she served when it was time to move on (thanks Tamara!)? There will never be an end to the questions but there was one more thing to do before diving back into the census records, newspaper archives, death certificates, etc. This morning, I threw the kids in the car and we took a trip to Ashland Presbyterian Church in Cockeysville. I didn’t recognize the area by GPS but when we got close I realized that I’d passed that place countless times before. The little stone church sits on a dangerous curve along Paper Mill Road, a route we used every time we went to visit Uncle Albert and Aunt Diane as kids. There, in the second row, plainly visible from the street, stands the stone of Sarah J. (née Harman) Grafton, my great great great grandmother. Grandma Sarah, pleased to meet you! I promise not to call you a “brick wall” ever again. Posted in: General, Research, Software. I’ve had this idea for a while now, but wasn’t sure how I should present it. The idea was to take a snapshot of my research status, broken out into each of the major surnames of my family tree. I limited the snapshot to great great grandparents, to keep the linked spreadsheet from ballooning in size. The result looks quite a bit different than I was expecting (which is why we do these things in the first place). Each column represents one surname. Each surname column is divided into three sections (let’s call them drums). Blue drums indicate the number of generations from myself to the first appearance of that surname. Red drums indicate the number of direct ancestors with a given surname that for whom I have research that supports their place in the tree. Green drums indicate the number of direct ancestors with a given surname for whom I have no sources (other than others’ assurances). I am currently for searching tombstones belonging to my 3rd great grand father, Jacob Bailey and his wife Barbara Ann Tracey. I know that they lived in the Parkton and Wiseburg areas of Baltimore county, Maryland where Jacob was a stone mason. Jacob’s death is mentioned in the 1870 census with a small notation that reads “died this day”. That page of the census was enumerated on 21 Jul 1870. His wife is believed to have died the year before. Jacob and Barbara had a large family with at least nine children, e.g., John Thomas, Warnel, Mary Catherine, Anna E., Jane, Mariam, William, Adam Isaiah, and Dora. Finding any of their children’s families would be helpful as well. This Saturday, I dragged my family to yet another cemetery. We stopped at the Wiseburg United Methodist Church in White Hall and combed through the rows looking for Baileys. It didn’t take long to find Bailey stones, but it soon became apparent that either a) Jacob and Barbara weren’t there, or b) their stones weren’t there. Instead, I found the family of Adam Isaiah, his wife Annie, and their children. Most of these stones had already been cataloged on Find-A-Grave, but you can never be sure how thorough other volunteers might have been. There was no one in the office the day we stopped by. I may have to visit during the week if I’m going to have a chance of looking at the church records. Next, we will be visiting other cemeteries in the area. This past weekend, my father and I took a trip to Western Pennsylvania. We planned to do this years ago, but for one reason or another the stars never aligned. This year we finally made it happen, and I’m glad we did. The Boddices emigrated from England at the end of 19th century and settled along the steep mountainsides that line the Monogahela River. While in the area, we stayed with my father’s cousin George Burgman and his wife Betty. George is the grandson of the immigrant, John Boddice, through the second marriage of his daughter, Jennie. On the first evening, while talking family history with him and his wife, George let slip that there was a Boddice family Bible. He explained that he’d looked through it years before and that there wasn’t much inside. After some digging through the attic, he brought down a thick volume with a badly degraded spine and plopped it on the table. I carefully opened the book and could feel the cover and spine slowly disintegrating in my hands. As George had mentioned, there was nothing in the front of the book, but that’s not where genealogy notes are kept in Family Bibles. At the book’s center were two complete pages detailing births and deaths of the immigrant family dating from 1872 to 1913. It was our first evening in Westmoreland county and the trip was already a success! I spent the evening scanning the Bible, photos, and funeral cards. The next day we drove to Monessen and visited Grandview Cemetery. The cemetery sits atop a high ridge overlooking the river valley. It didn’t take long to locate John and Lillian’s graves based on a photo I’d found online. Curiously, there was a lot of empty ground around their headstone and we wanted to know who was buried near them, if anyone. The cemetery office was closed, so we left a message and decided to return later in the day. George led us back into the town and showed us the house where George and Lillian had lived, the locations of bars that they used to frequent, and the steep roads and staircases they used to climb the mountainside. After touring the town we returned to Grandview and found the caretaker’s son near the office. The young man took us inside and pulled a small pile of burial cards which I transcribed. The caretaker showed-up soon afterward and pointed us toward the necessary sections. At the day’s end, we returned to Dravosburg, for one last night. On our final day, I explained that I wanted to visit the grave of another 2nd great grandfather, that was no relation to George. 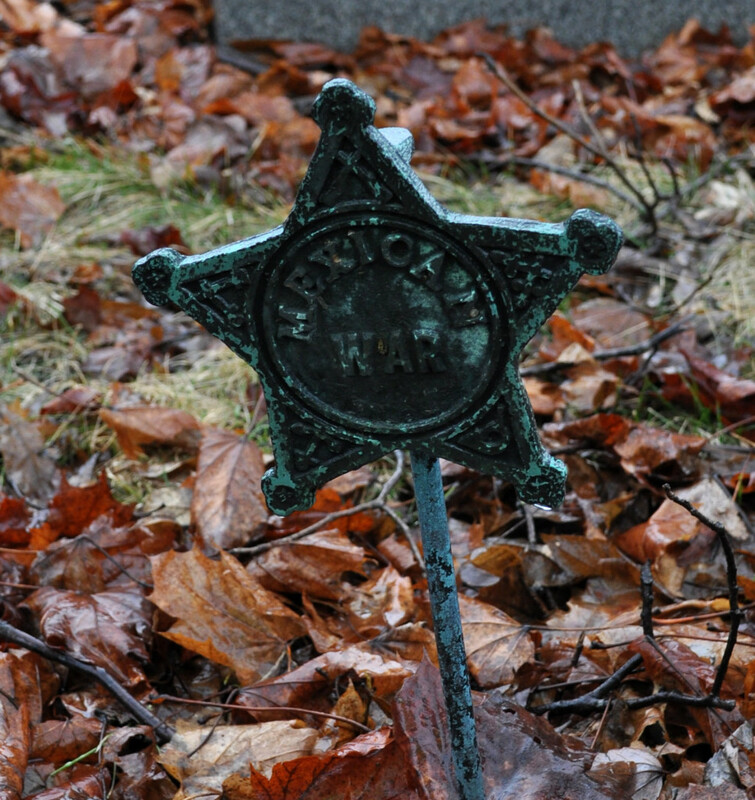 Luther Rambo Mack was buried in Monongahela Cemetery near Charleroi. I had no idea where that was in relation to Dravosburg, but we ended-up traveling back up-river (along the opposite bank) the same as the day before. The entrance to Monongahela Cemetery was beautiful. Tall old trees cast shadows across deep green slopes with a simple road winding up into the woods. We quickly found the cemetery office and then spent the next 10 minutes trying to orient ourselves among the labyrinthine paths and roads that criss-crossed the grounds. It was easily one of the best kept non-military cemeteries I have ever visited. At the top of the ridge, in a more sparsely treed area, we found the stone for Luther, Annie, and their immediate families. I took all the photos that I could, and some extras for Find-A-Grave, and called it a weekend. Thanks again George and Betty! I made a breakthrough today thanks to the Western Pennsylvania School for the Deaf. I first discovered Florence L. Boddice (my grandaunt) in early 1900 census data that placed her at the Western Pennsylvania Institution for the Instruction of the Deaf and Dumb (yeah, they’ve changed the name). In 1996, my grandaunt Aggie told me that Florence was deaf, but not from birth. She also said that Florence played the piano beautifully even after her hearing loss. Florence’s name came up again this past August while speaking with a cousin. He showed me a large photo of the Boddice family taken on Christmas 1932. I asked why Florence was missing and he explained that she died before that date. Wanting to know more about her, I e-mailed the Western Pennsylvania School for the Deaf and asked whether they had any records. I didn’t really expect a response, but respond they did! They initially told me that their old records were spotty, but that they would look just the same. Today, they responded with more information than I had hoped for! It appears that Florence is listed on an early registration log as the 862nd student of the school. It also states that she became deaf as a result of measles when she was 9 years old, that she enrolled in the school in 1907, and graduated in 1920. What happened to her between graduation and Christmas 1932 is still unknown. I mentioned earlier that I’m experimenting with the GRAMPS family tree software. I’m still waffling on whether to make that switch. Adopting another application would be nothing short of life-changing. I have no idea how much time I’ve invested into TMG, but it could probably be measured in the 1,000s of hours. Any move to another application would almost certainly mean that some of that data would be lost. I probably wouldn’t lose names, dates, and relationships, but would probably lose a great deal of painstakingly recorded sources. So, while I weigh which way to go, I continue to enter data and learn about TMG. Today, I experimented with recording and reporting census data. To date, I’ve been using tags for each individual, i.e., if John Stanley appeared in the 1880 census, I would give him a “Cen 1880” tag. I would also include the date and place of enumeration, dwelling and family numbers, his age, birthplace, and occupation. If he had six people in his household, each person that was enumerated with him would also get a “Cen 1880” tag. Though inelegant, I liked being able to see (at a glance) if a given individual was missing the census tag for a given year. The problem with this method is that the structure of each household is lost. This has bugged me for sometime but I didn’t know what to do about it. I have used thousands of census tags, and am not about to go back through the database and change everything. Today, I found a solution. The first thing I did was look at how other TMG users handle census data. The program is very customizable and there’s no one right way to handle censuses. A number of published solutions (here, here, and here) suggest establishing one census tag per household and attaching all other members as witnesses to the Principal. I’ve known about this solution for years but never implemented it because I didn’t like a bunch of undifferentiated Witness tags floating around. After clicking around the Master Tag Type List, I discovered that within a given tag’s properties (Tools > Master Tag Type List > Cen 1880 > Edit) there’s an option (in the Other tab) to use the tag’s original title, rather than Witness (Display Witnessed Tags / Using the Label Above). Now, even the witnesses to the primary “Cen 1880” tag have the same apparent tag. Squee! Attaching people to the Principal as Witnesses recreates the census households, it does not however give a sense for the household’s structure. For that, I created dozens of roles for each census tag. Within the “Cen 1880” tag, I currently have the following roles: Head, Wife, Dau01, Dau02 thru Dau10, Son01, Son02 thru Son10, and Boarder. I can add more as needed, e.g. Mother-in-Law, Grandmother. Each of these roles has a sentence associated with it. Dau02 for instance, has: “[RG:Dau02]<, aged [WM],> appears in the 1880 Federal Census <at [L]> as the daughter of [P].” Since the roles are gender specific, there’s no need to create a Female Sentence Structure under the Tag Type Definition. When adding Dau02 as a witness, I now enter her census given age (whether it’s correct or not) in the Edit Witness / Memo field. That supplies the [WM] variable with the age required. Earlier censuses that do not list relationships include sentences like: “[RG:Enum02]<, aged [WM],> appears in the 1870 Federal Census <at [L]> in the household of [P].” Other than this, the sentences do not vary much between censuses, so I used cut-and-paste liberally when building roles. So, why create a Head role instead of just using Principal? 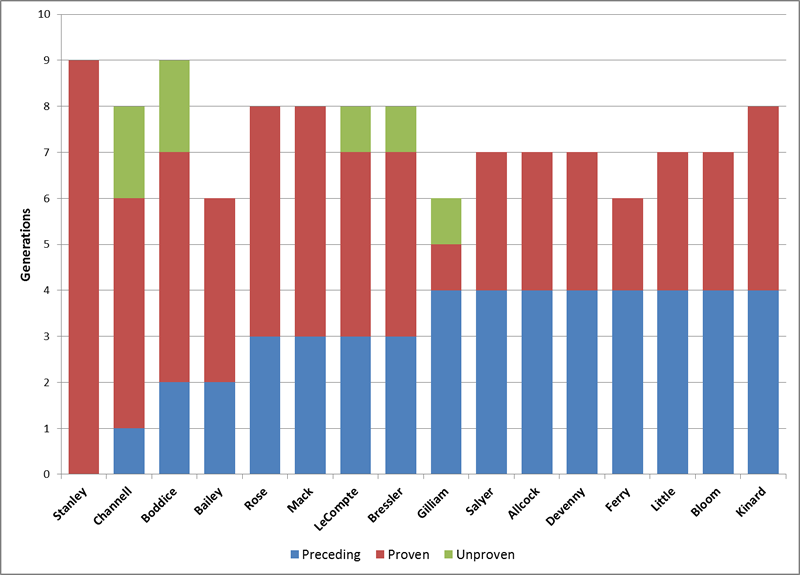 In my original implementation of census tags, every person that appeared in a census had a Principal role. In my new system, the Head role has the following sentence: “[P] appears as head of household in the 1880 Federal Census <on [D]> <at [L]>.” By leaving the Principal role intact, I do not have to go back through all my old census tags and adjust everyone’s role to fit the new system. The old sentences remain unchanged. When entering new families however, I can select their appropriate roles. The system requires a lot of upfront work creating roles and sentences, but I think the result is much cleaner. Anyway, that’s how I’m entering census data now. I hope this write-up helps someone! As always, feel free to e-mail me with questions and/or ridicule.